Correction: In this printed feature, we incorrectly stated that AFSCME Local 3299 had only 47 members. AFSCME Local 3299 actually has 20,000 members statewide– a local UCSC unit of the union has 47 members. There were about 20 of them. They stood in the sun at the base of campus on concrete islands planted amid the steady flow of buses and student drivers. They held signs and handed out flyers. Some students stopped to talk to them, but most didn’t. At UC Santa Cruz, union protesters aren’t an unfamiliar sight. That was on April 28, a Saturday — appropriate, considering that without unions, weekends might not exist. A few days later, on May 1, just over 50 students and union workers took to the campus streets — with the workers delivering their bargaining proposals in person to UC administrators. May 1 was International Workers’ Day, almost a must-show for the pro–labor rights crowd, both student and worker. But for UCSC, the crowd of 50 was a little anemic. The few workers and students present chanted alternately in English and Spanish, and though their numbers were low, energy was high. The union demonstrating both days was the American Federation for State, County and Municipal Employees (AFSCME), with the local chapter being AFSCME Local 3299. It is a small union, with the local UCSC unit comprising about 47 members. Public sector unions, like the ones at UCSC and other public entities, aren’t nearly as marginalized as unions in the private sector. Public sector, or government, workers are unionized at about a 37 percent rate, compared to only about 7 percent for workers in the private sector, according to the Bureau of Labor Statistics. Still, the university budget crisis is a storm that hasn’t let up, and unions at UC haven’t weathered it unscathed. From AFSCME’s workers to the librarians and lecturers of University Council – American Federation of Teachers (UC-AFT), union members in the public sector have been hit right along with students by the financial crisis buffeting the state and the UC system at large. 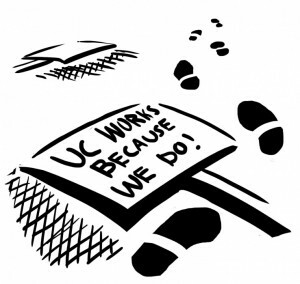 With budgets being slashed, contracts renegotiated and union members dropping out of the system left and right, it’s time to look at the working environment provided by Santa Cruz’s largest employer: UCSC. The green shirts of AFSCME members make them easily recognizable for UCSC students. This university employees union demonstrates frequently, and can often be found protesting alongside students both on campus and at the state capitol. Like UC students, they’ve had a rough time lately. Spikes in pension and healthcare contributions have created some significant hurdles for public sector unions. From 2007 to 2010, professional support staff positions have dropped from 3,010 part-time and 1,897 full-time employees to 2,703 and 1,827 respectively, with hiring freezes taking as much of a toll as employee layoffs. “We’re being asked to do more work with less people,” said campus electrician and AFSCME member Gary Riggs. Layoffs and overwork are two iconic responsibilities that UC unions are finding it increasingly difficult to prevent. AFSCME currently doesn’t provide job security to its members, and that item is central to their contract negotiations with the university. “As the article is written now, the university has the ability to lay off employees and then contract out that work later with no repercussions,” Riggs said. Additionally, AFSCME was hit by a breach of contract scandal on March 6. UCSC had allegedly been taking additional healthcare and pension contributions out of workers’ paychecks. This is something that’s supposed to be bargained over, according to California Government Code Section 3571, but UCSC allegedly did it before the contract negotiations had begun. 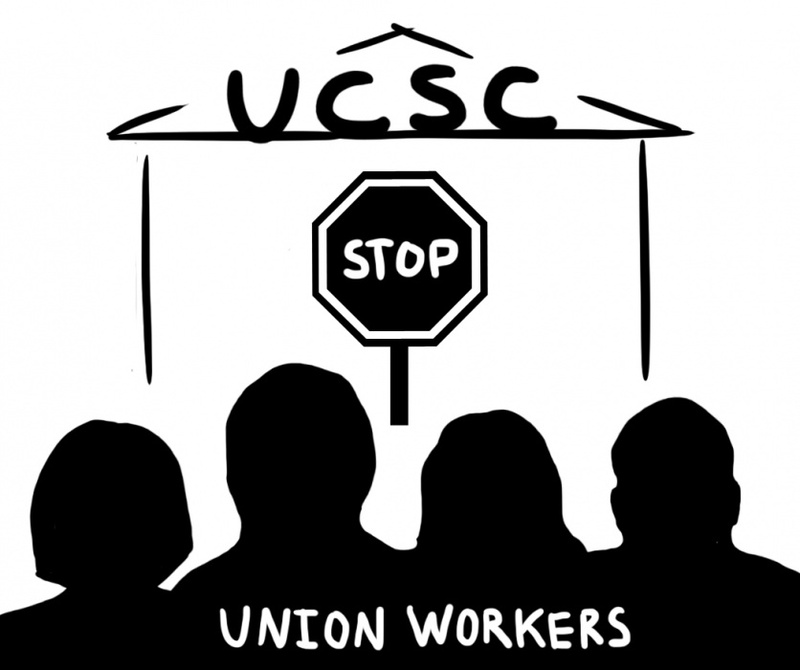 AFSCME took UCSC to court over the issue, and it’s currently being resolved. UCSC and AFSCME are now at an impasse regarding AFSCME’s contract and are headed to mediation on May 7. With money tight, UCSC is being forced to take a harder stance toward its workers, union members included. Some union members, however, don’t see it that way. Rebecca Gilpas, an AFSCME organizer, said the UC simply isn’t being straight with them. Miki Goral, state treasurer of UC-AFT and a librarian at UCLA, is skeptical as well. AFSCME is one of the more visible unions on the UCSC campus, so their plight hasn’t gone unnoticed. And UCSC is renowned for the cooperative spirit fostered between union workers and students. Former Santa Cruz mayor and former community studies lecturer Mike Rotkin said UCSC is notable within the UC system for how it treats unions. But considering UCSC’s recent stance toward AFSCME’s contract negotiations, that may be changing. UC-AFT is a far cry from AFSCME — with over 3000 members on all the UC campuses, the librarian/lecturer union has more clout and is the only academic union on campus. But they’ve taken hits as well, especially the librarian unit (unit 17; the lecturers are represented by unit 18, and have their own contract, which is also being negotiated). Librarians at UC, who are largely if not entirely unionized, have suffered pay inequities for years. On average, they’re paid roughly 20 percent less than librarians at California State Universities (CSUs) and community colleges, with some variations based on seniority and rank. This, Lyons thinks, hurts the UC. And the UC realizes that, too, but they’ve reacted in a different way. “Because the UC recognizes that to retain librarians they need to pay them better, what has happened in a lot of cases are rank and file librarians being made into managerial staff and given managerial stipends,” Lyons said. Stipends might not sound like an issue, but the managerial promotion amounts to a union-dodging measure by the UC. Additionally, the UC has tapped another resource to avoid dealing with union members: students and temporary workers. UC-AFT treasurer Goral has noticed a trend. Lyons notices the trend at UCSC as well. Librarians, who predominantly have master’s degrees, are jumping ship to work at CSUs and community colleges, or simply finding work elsewhere. Their jobs are being filled by untrained students and temporary workers. And their pay is stagnating. But the union isn’t completely defanged. Lecturers, on the other hand, have experienced a different trajectory. As lecturers are usually cheaper than professors and other tenured university staff, their use has skyrocketed. As someone who has taught at UCSC for several decades, Rotkin can comment on trends in lecturer use. Many lecturers are part-time, and many of them don’t get sick leave or vacation. And when the university needs to make cuts, new lecturer hires are usually first to go, as their job protections don’t tend to kick in until they’ve been at the university for several years, Rotkin said. “They can’t get rid of you ‘just because’ or just to save money, but there’s no guarantee you’ll get to your sixth year,” Rotkin said, referring to the year when lecturers get a slew of protections. Layoffs. Hiring slumps. Overwork and under-training. These trends are endemic among UC unions. Many people, including Rotkin, say that if unions are to survive and flourish, they have to start looking past the bargaining table. A central issue, as Rotkin sees it, is union reluctance to focus on their declining numbers. Rotkin is referring to the union struggles in states like Wisconsin, fueled by the Wisconsin governor Scott Walker and widespread anti-union sentiment. But motions like that aren’t restricted to the Midwest. Some union actors have already taken steps into the political arena. What Rotkin said he wants to emphasize is how tied together UC students and UC unions are — they’ve got shared interests. Maybe next year there will be more than 50 students demonstrating with AFSCME. After all, as the April 28 protesters chanted, what will students be once they graduate?